The governor’s comments came after a committee of top real estate professionals, asked to review how Idaho could update its rules for transfers of state endowment lands to match “modern business practices,” recommended eliminating the requirement for public auctions and exempting the transactions from the state’s Public Records Act. 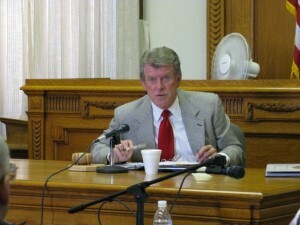 Otter immediately objected to the proposed changes, some of which would require amendments to the state Constitution and the Admissions Act, by which Idaho became a state. The state Land Board, which commissioned the report from the committee of professional real estate experts, praised the panel and thanked it for its work, despite objecting to some of its key recommendations. The Land Board is made up of the state’s top elected officials and is charged by the state Constitution with getting the maximum long-term financial return from state endowment lands. Those lands are held in trust to earn money for public schools, universities and other state institutions. “Our intent was to provide flexibility to the state, then let the state decide through its laws how best to govern these transactions,” said Robert Phillips, president of Hawkins Companies and a commercial real estate developer. The group’s report said, “Participants in private sector and commercial business transactions typically expect confidentiality in negotiations and protection of trade secrets of the parties. Likewise, it is recommended that the same protections be afforded to the state Board of Land Commissioners when negotiating leases, purchases, or sales of state endowment lands,” in order to secure maximum financial returns. Otter said there might be a point during negotiations when not everything is released, but it would all have to become public eventually, he said. Though the panel proposed an ambitious timeline, to present its recommendations to the Legislature this year and then get constitutional amendments on the ballot in time for the 2010 election, Land Board members said they thought that was unrealistic. “It could be worked out this legislative season,” said residential real estate broker Bryant Forrester of Homeland Realty, but state Controller Donna Jones shook her head no.